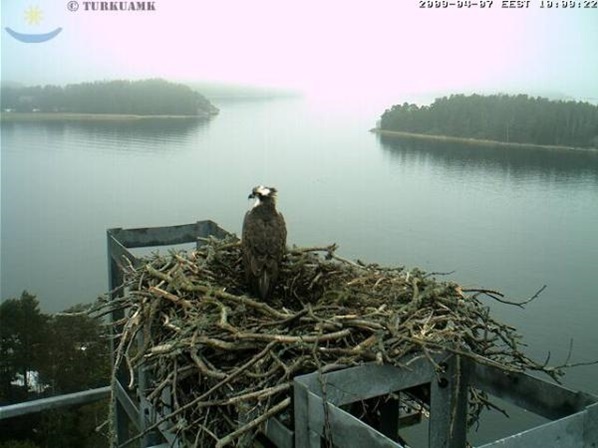 This is a picture of an osprey in Finland's southwestern archipelago. You can watch the bird live [url=http://natureit.net/site/saaksikamera.php ]here. [/url] The picture refreshes automatically quite often. If your Internet connection is very slow, the picture quality may not be very good. In that case please click on the text below the picture for a connection suitable for a slow connection. The osprey family were here in the summer of 2008 and have now returned to their old nest. Some hawks were spotted at the nest before the ospreys returned from the south but the hawks have probably given up all hope of conquering the nest. This is great CB! I love to see the birds. Is the osprey endangered where you live? AlpheccaStars Is the osprey endangered where you live? No, not as far as I know. I checked the Finnish Wikipedia for information. It says about 5,000 pairs nest in Europe, of these 1,200 in Finland, and the numbers are on the increase due to decreasing pollution in the food they eat. The osprey is common throughout Finland. The northernmost birds nest in the very north of the country. The osprey isn't very choosy as to where it nests as long as it's close to a lake or the sea and the bird can access its nest easily. Its flying is said to be rather clumsy and awkward due to its large size. (I know absolutely nothing about this bird. All the information is from Wikipedia. The osprey usually lays two or three eggs at the beginning of May in Finland. I'm looking forward to that! I just noticed that you can have a close-up of the centre of the nest by clicking on the Lähikuvaan in the top left corner. By clicking again, you return to the original picture. I also gave incorrect information about other birds that were interested in the nest. It was actually only one white-tailed eagle or sea eagle, as it is also called. I am from a developing country and a developing area... we are always respecting all those contributing to environment. That is a long way I know, please allow me to forward this post amond all my friends and hope it helps bring out everyone's conservation conscious. I have been informed about another nest on an island close to the city of Oulu. Because of its more northern location, there is less vegetation. You can view it [url=http://kotinetti.suomi.net/saaksi/index.php ]here. [/url] Information about the birds is available in English by clicking on the "In English" text. That's really cool. Apparently there is one similar to this in England where they had climbers abseiling down a cliff to lodge a camera in a narrow crevasse, which is next to the coast. You can watch what is being captured in a small hut nearby. It made it to BBC News when one day some rare seabirds where caught on screen, which was quite incredible. A thunderstorm broke the camera on 23 May and fixing it is impossible without disturbing the nesting birds. Live pictures won't resume until the beginning of July. A recent update says that even though a bolt of lightning stuck near the nest last Saturday, the two ospreys are all right because they have been flying close to their nest. It is possible that a video camera will be installed in a month or so after three chicks have hatched out any day now. So far the Internet connection needed for live video hasn't been good enough that far out to the sea, but technicians are looking into that possibility. The nest is situated on top of an electronic beacon board intended for ships in a sea with hundreds of islands. There's nothing wrong with the electric lines and the Internet modem for the camera is also working fine but the actual camera or some of the electronic devices are damaged.